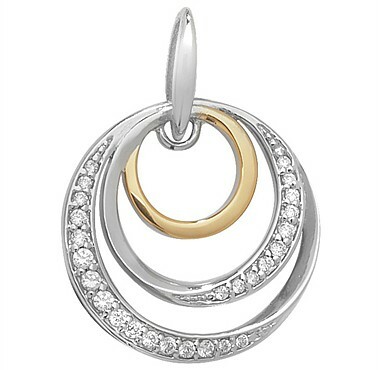 Graduated circles, featuring small, smooth 9ct gold over sterling silver circle complimented by two larger Sterling Silver circles, set with sparkling cubic zirconia. 2.5cm/1” including bale. With 18”(46cm) Sterling Silver chain. Actual size: 2.5cm (1”).